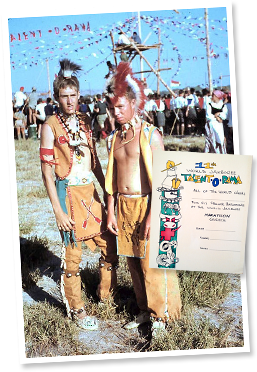 In a ceremony that looked back to the very origin of the Scout movement and into the future to a world of respect for all, irrespective of religion, colour or race, the 11th World Jamboree was officially opened on Thursday, August 1st, 1963 at 19.30 hours in the decorated arena. All participants attended the ceremony as spectators and one Scout from each country where previous Jamborees were held played a special part. During the ceremony the Jamboree song was sung by all participants that were requested to learn the song beforehand so that they would all sing it in unison. "Let us look upon this life as a tremendous adventure, and upon ourselves, Scouts, as Crusaders for a better world"
said Crown Prince Constantine, Chief Scout of Greece, in his address to Scouts and visitors packed into the Amphitheatre of the Marathon camp. He called upon participants to make the Jamboree symbolic to the world as a true centre of happiness, friendship and peace. The origins of the Scout movement were recalled by the sound of the Kudu horn, which Baden-Powell used to summon the boys at the first Scout camp ever held, at Brownsea Island in 1907. The Kudu, a large buck with a majestic spread of horns, is one of South Africa’s wild animals. As another symbol of Brownsea Island, a Star fire had been lit in the centre of the arena, with a torch nearby ready to use for lighting the Kylixes standing beside the symbols of the 10 previous World Jamborees. After the echo of the Kudu horn had died away, a Scout stepped forward. "This horn", he said, "first heard by the founder, Baden-Powell himself, at Brownsea Island in 1907, echoes today at Marathon, around the same Camp Fire of Friendship, to carry us back over 56 years and to unite the past with the present. That first camp fire, around which 32 British boys gathered, is the beginning of the Boy Scout National Movement. It blazed in the hearts of thousands, and then millions, of boys throughout the whole world, and in 1920 it illumined the first Scout Jamboree of Olympia". A United Kingdom Scout then took a torch, already lit, advanced to the 1920 kylix of the first World Jamboree, and lit it. 1959 at Makiling Park in the Philippines. and in 1963 the same flame of friendship comes to Marathon to enlighten us all, these 14,000 participants as well as the 9,300,000 Scouts of the world whose thoughts at this very movement are with us here". "Your Highness, Chief Scout of Greece - I bring this Flame of Friendship from the 10th World Jamboree that was held in Makiling Park at Los Banion Laguna. On behalf of the representatives of the Scout Movement present here, I request you to light the kylix of Friendship for the Marathon World Jamboree". "Brother Scouts, I greet you, the Scouts gathered here at Marathon, and through you, I greet nine million members of our brotherhood all over the world. Our thoughts turn to them whose messengers we are. You will return to them strengthened in our ideals and with a renewed sense of mission. Brother Scouts, let us Scout for higher ideals and wider horizons. With this, our emblem of the 11th World Jamboree, we have given ourselves a new challenge. It is a challenge with which to face - ourselves, our neighbours, and the world in general. As individuals, we shall never be satisfied with our actions as long as they do not correspond with what is best in ourselves. With our neighbours, we shall always try to find what is best in them and, within the world as a whole, we shall respect each others religion, colour and race. We shall always be ready to serve rather than be served, to help rather than be helped, to comfort rather to be comforted, to protect those in need of protection and, above all, to be a reliable friend to those who put their trust in us. While accounting for some of these higher ideals, let us also scout within the wider field of human problems. Let us look upon this life as a tremendous adventure and upon ourselves. Scouts is Crusaders of a better world. Here at Marathon you will get inspired by the spirit of the Anient Greeks. Two thousand years ago the Marathon Runner set out to carry his message of victory to Athens. Let us hope that all of us who belong to the family of Scouts shall one day, like the runner from Marathon, take a message of victory to the City of Human Vitrue and the Brotherhood of Μan. This Jamboree of ours shall be symbolic to the world by being a true centre of Happiness, of Friendship and of Peace. Brother Scouts, I declare the 11th World Jamboree open". Fourteen thousand Scouts from 89 different countries and every Continent, on earth, who are gathered together at this sacred and glorious site of Marathon, send a warm fraternal greeting from all the free world, and on the occasion of the 11th World Jamboree, to the immortal city of goodness and beauty, spirit and light. Remembering with particular emotion the Oath of the Young Athenian, so similar to our Scout Law and Promise they declare once more their faith and devotion to those immortal principles that will guide this word gathering as they guide their whole lives. They address a message of love, friendship and world brotherhood to all mankind. The message will be delivered in relays and from hand to hand by the Scouts of each country represented here, to the Mayor of Athens, and then to the world. Now that the Jamboree is open, I shall ask one Scout from each Sub-Camp to come and receive the flame passed on to us through previous Jamborees and to carry it to their Sub-Camps. This flame will light our lives at the Jamboree here at Marathon." Eleven Scouts, one from each sub-camp, ran to the centre of the arena to light their torches, and stood with them by the placards bearing the names of the sub-camps as the 11th World Jamboree song was played again. We thank Thee because Thou has given us the opportunity of participating in the Marathon Jamboree. , Bless all those who have worked hard to make this grand Scout gathering of friendship and understanding possible. Give us strength so that we may be Scouts in thought and indeed always and thus make the Jamboree a success. Strengthen our brother Scouts all over the world and help them wherever they belong, to strive for higher ideals and wider fields of service. Amen". 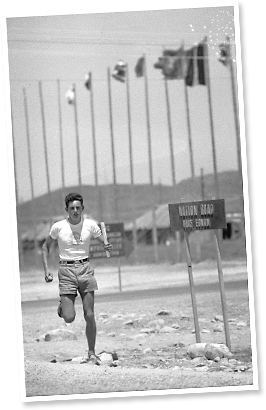 On the second day of the Jamboree, August 2nd, at sunrise, (at approximately 5.30), the Marathon Race began, to carry a message from the members of the Jamboree to the City of Athens. The message was then relayed all over the world announcing the opening of the 11th World Jamboree. 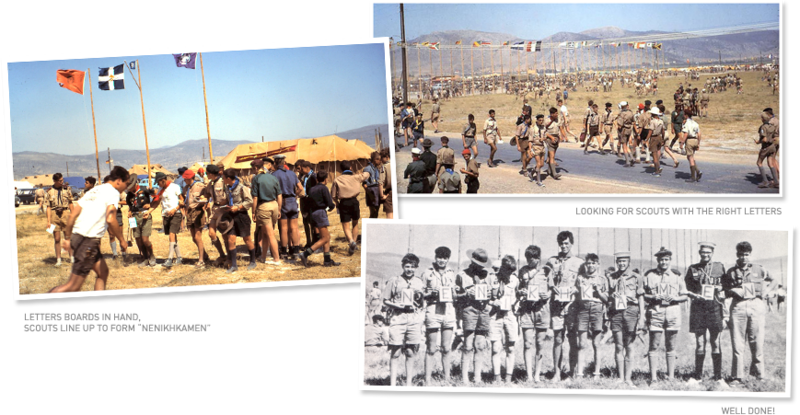 One Scout from each delegation participating at the Jamboree took part in the race that was run in relays of 500 metres and terminated before the Memorial to the Unknown Soldier, in front of the Greek Parliament, at about 11 a.m. A wreath was laid at the Memorial in the presence of the Jamboree Camp Chief, Heads of delegations each accompanied by one Scout and many officials. A reception for these officials followed in the Athens Town Hall, during which the Marathon Message -on the paper scroll handed on the previous evening by the Crown Prince to the Marathon Runner- was handed to the Mayor of Athens, Angelos Tsoukalas. The Mayor then ploclaimed the Jamboree open to the whole world. The Marathon Ran was another ceremony that harked back to the Golden Age of Greece. In 490 BC, after the great battle of Marathon, an Athenian foot-solder, Phidippides, ran all the way from Marathon to Athens to announce the victory. It is said that after gasping out "NENIKHKAMEN" -we have won- he fell dead from exhaustion. It was to symbolize his run that, when the Olympic Games were revived in Athens in 1896, the Marathon Race came into being. "We carried our message from Marathon to Athens faster than Phidippides. With one small difference: there were 87 of us, one from each country, to share the running." On the third day of the Jamboree, Saturday August 3rd, all campers took part in the "get acquainted" Wide Game, something new and tremendous in Jamboree history. In a variation of the theme of 11, each participant was given a paper card on one side of which one of the letters N, E, I, K, H, A or M was printed. The goal was that 11 new-found friends of 11 different nationalities, holding their letters at chest level, had to join and line up in such a way that the 11-letter ancient Greek word NENIKHKAMEN -"we have won"- would form. As discussed in the previous section, these were the actual last words of Phidippides, the ancient Greek soldier-messenger who ran all the way from Marathon to Athens, 26 miles 385 yards or 42,195 km to convey to his fellow Athenians the news of victory at the historic battle of Marathon in 490 BC. He had hardly whispered "NENIKHKAMEN" when he fell dead from exhaustion. He was the one that defined the classic Marathon route introduced in the first modern Olympic games held in Athens in 1896. Participation in the Wide Game qualified towards the Laurel Award (Epathlon Dafnis). Almost every Scout at the Jamboree took part in the perfect start for the Jamboree, a game that brought scouts from all over the world, closer. Sub-Camp Fires In order that the troops of the Sub - Camps can get to know each other, a camp-fire will be lit on Friday, August 2nd between 20.00 and 21.30 hours in each Sub - Camp area. Regional Campfires There will be Regional Camp Fires on Tuesday, .August 6th again between 29.00 and 21.30’ so that Scouts from the various parts of the world may meet. Inter-Sub-Camp Fires These will be lit on Wednesday, August 7th after previous agreement by the Chiefs of two Sub - Camps, in whichever Sub - Camp they decide on. Sketches etc., from displays which are determined unsuitable for the Arena, may be presented at these Inter - Sub - Camp fires. No General Camp Fire will be held. Labours of Hercules was a skills game played throughout the Jamboree duration at specially - established areas within the Jamboree Camp. The game gave Scouts the opportunity to prove and develop their physical strength and scout craft ability. It was designed to test both individual and team agility and counted towards the Laurel Award. Hercules was one of the best known ancient Greek heroes and his name is still synonymous to a man who is strong, vigorous, dignified, alert and steadfast - in other words, a skilful athlete. Each Scout, who took part in the "Labours" could prove himself to be a young Hercules. Schedules for playing the Labours of Hercules game were made on a Sub - Camp basis. Each Troop had one a day when two of its patrols, chosen in advance, would take part in the "Labours". 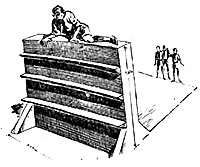 The "Labours" were a chain of 12 obstacles (equal in number to the actual Hercules' Labours) which Scouts belonging to two patrols should overcome, competing as regards speed. Two of the obstacles required combined cooperation, whereas the rest depended on individual effort. 1. Log - raising Patrols in relay formation. On signal 2 Scouts run to rope. No 1 coils the rope and throws one end of it over a cross bar 5 mtrs away. With end of rope No 2 ties timberhitch around the log, then both Scouts hoist the log off the ground by pulling on free end of rope. After the log has cleared the ground it is dropped, No 2 unties the timberhitch, No 1 pulls rope from crossbar, carries end to starting line and touches off Scouts No 3 and 4 who repeat the performance and so on until the entire Patrol has run. 2. Overhead Ladder A wooden ladder is fixed horizontally at a height of about 2 metres from the ground. Each Scout swings by the arms and advances along the ladder, rung by rung, till he reaches the end without touching the ground with his feet. If he touches the ground he begins again from the first rung. 3. Vaulting Fence Each Scout in the Patrol vault over an obstacle one metre high, touching it with his hands only. 4. Crawlrack A wooden rack is fixed parallel to the ground high enough to allow the body to pass under it. Each Scout has to crawl under the rack in turn. 5. Walking the Boom A boom 5 cm wide and approximately 4 metres in length, is fixed about 60 cm above the ground. Wach Scout must walk along the boom without falling off. Should he fall off he must start again from the beginning. 6. Climbing A wooden-fence 1,60 metres high is the next obstacle. Each Scout in the Patrol has to climb the fence unaided. Steps are provided for the descent on the other side. 7. Rope-swinging Each Scout has to swing himself over a ditch with the aid of the rope that is fixed overhead. 8. Passing through tyres A row of eleven (number not coincidental) tyres hang about 1.50 metres above the ground, so that they form a kind of tunnel. Each Scout must drag himself right through this tunnel. 9. Pitching Three iron pegs are fixed vertically in the ground at a distance of about 4 metres. Each Scout is provided with three small iron hoops. With these three shots he must throw at least one of three hoops over the peg. 10. Tyre Relay-Race Each Scout in the Patrol must trundle a tyre along a traced path without overstepping it. If he does he begins again from the beginning. When he gets back to the starting-point, he touches the next Scout who trundles his tyre and so on. 11. Scaling the Ladder A wooden ladder fixed vertically in the ground is the next obstacle. Each Scout in the Patrol climbs up the ladder step by step until he reaches the top and then comes down the other side in the same way. 12. Hog Rolling A log is placed against 3 stakes. At about 5 metres distance three other stakes are fixed in the same way and at an angle of about 90°. All the Scouts together, as a Patrol, must push the log along the ground with their hands or feet from one set of stakes to the other and then roll it back again to the starting-point. Somewhere between a bazaar and a folk art festival, came the Talent-O-Rama. Here, at a site as festooned with bunting as a battleship on a national holiday, Scouts in small groups daily displayed aspects of Scout-craft or skills native to their country. Often, there were as many as 50 activities in progress simultaneously. 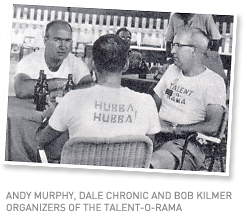 Talent-O-Rama, staged at Marathon by three American Scout Executives, Andy Murphy, Dale Chronic and Bob Kilmer, members of the International Jamboree Staff, was, indeed, one of the major successes of the Jamboree. It gave Scouts the opportunity of demonstrating their skills and ingenuity to their fellow - campers. A special place was set apart where spaces of 3 metres x 3 metres were allotted to Troops or Delegations that wished to make displays or demonstrations of scout craft. Demonstrations took place every afternoon, 4.00 to 7.00 p.m. excluding Thursday 1st, Saturday 3rd and Tuesday 6th of August. Each Troop or Delegation was expected to operate its booth during at least one afternoon. Basketball and Volleyball. There were six basketball fields and eight volleyball fields within the camp area. Participation in these games was free regardless of Scout rank, provided the responsible Service (that may also form teams) was informed. The duration of games will be according to international regulations. Referees were appointed from among the campers who had some experience of refereeing and who volunteered their services. Balls were made available by the Jamboree Services. There were no official matches between nations nor any championships were held. Rifle - range. Scouts wishing to practice shooting registered with the responsible Scouter and order of priority was be followed. Scrupulous adherence to rules and the way of using a gun, explained on spot, were indispensable conditions for those that participated in this sport. Τhe rifles used were air guns provided by the Jamboree Services. There were no official international shooting competitions. Scouters and their assistants who were responsible for the Rifle - range, also acted as judges (referees). The Classical Games took place on Monday, August 5th and included the Triathlon (Jumping, Running, Throwing the Scout Staff) and a Relay Race between the Sub-Camps. This event gave every Scout taking part in the Jamboree an opportunity to show his prowess. It included an 80 metre sprint, long jump, scout-staff throw. It was divided into two parts: Preliminary and Final Heats. Between 9.00 and 12.30 and 16.00 and 19.00 the preliminary heats were run on the sports field of each Sub-Camp. Only one attempt was allowed for the long jump and the staff throw. Only those reaching the following limits were allowed to have their participation recorded in the Epathlon Daphnis Scorecard. The best three in each Sub-Camp would compete in the Finals. The Finals were held on the same day between 20.00 and 22.00 hours. Two attempts were allowed to each athlete in the jumping and throwing competitions. Winners would be the three Sub – Camps that have the highest total of points. The relay race was run between two opposite lines of athletes 80 metres apart. There were 20 Scouts in each team, 10 on either side. The Scooter in charge of Sports in each Sub – Camp would select the runners from those who took part in the Preliminary Heats of the Triathlon. Winners would be the Sub – Camps that finish 1st, 2nd and 3rd. On Tuesday, August 6th, 1963, the Patron of the Jamboree, King Paul of Greece took the salute at the Grand March Past in which 14,000 Scouts from 89 countries participated. 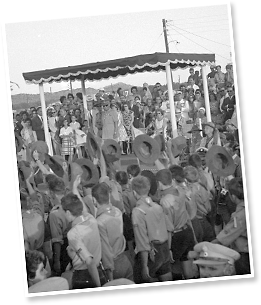 The King, in army uniform, accompanied by the Queen Fredrika and Crown Prince Constantine, Chief Scout of Greece, on arrival at the Jamboree were met by a detachment of scouts comprising one from each contingent and then drove to the special stand. The band struck up and 89 contingents headed by Afganisthan, followed by other countries in alphabetical order and the Greek contingent in the rear. After the March Past, the boys wheeled round and formed up in a mass assembly in front of the Royal Family. Then five Scouts representing the five Continents presented the symbol of the Jamboree to the King. Australasia was represented by a Scout from New Zealand, America by Mexico, Africa by Nigeria, Asia by Thailand and Europe by Denmark. The troops dispersed to their Sub-camps to the music of bagpipes, while the King visited the National Exhibitions. The King then paid brief visits to all the Sub-camps and wound up his visit to the Jamboree with attendance at a reception at which those present included members of the Athens Diplomatic Corps, contingent leaders, and G.H.Q. staff. On the afternoon of August 7th, Wolf Cubs from the Capital area districts visited the Jamboree and moved about freely in the Sub - Camps. The campers welcomed their younger brothers to the Jamboree and showed them the various activities. At around the same time, King Paul of Greece held a reception for HQ Staff and Officials at the Gardens of the Royal Palace, in Athens. 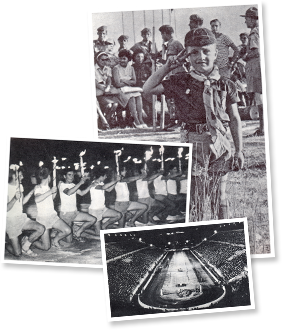 Later on that evening, 2300 members of the Jamboree Camp put on a display, under floodlight, in the famous Panathenian Stadium in downtown Athens, in aid of Queen Frederica's fund for Greek Students, for young Greek men who otherwise would not be able to continue their studies. The first modern Olympic Games took place in the same Stadium, built exclusively from white Pendeli marble, in 1896. The Stadium which holds about 65,000 spectators was packed to capacity. Representatives from every Contingent took part in the March Past which opened the show. Due to time and space limitations, only 26 people from each country took part in the parade, 25 Scouts lead by one Scouter. Where possible, half of the scouts were dressed in national uniform and the other half in (their country's) scout uniform. Delegations paraded in fours and one Greek Scout accompanied each delegation holding a plaque on which the name of the country was written. Denmark, France, Iceland, Italy, Jamaica, Japan, Luxembourg, Nigeria, United Kingdom and the USA provided special nine-minute shows. Very little opportunity was available for rehearsals and it was typical of all the happy events of the Jamboree that the boys worked through the heat of the day rehearsing their shows in the Stadium so that, in the evening, the crowd would see one of the most spectacular displays ever to take place in the Stadium. There is no doubt that the colorful and dramatic performance left a lasting impression on all those who were privileged to be present. August 8th was Sea Scouts Day. During the morning and afternoon nautical activities and displays were held along the 3½ kilometres of sea shore with the narrow sandy beach, bordered by pine trees. Rowing and sailing displays were given by mixed troops as were also displays of sea-sports and swimming; all campers could watch. 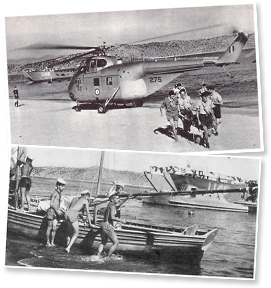 There were rowing and swimming events, an obstacle race, caste building, life-saving demonstration with the aid of a helicopter, water polo games, and even a rowing withour oars event. This display was held under the regulations of the Federation Aeronautique Internationale. Air Scouts were able to practice with their models in the demonstration area between 10.00 and 11.00 am on the 5th, 6th, 7th and 8th August. Competition Judges were appointed by the Jamboree Headquarters. "You Scouts, who have come here from far distant places, have come as ambassadors from your own lands, to be made welcome here in Greece. The word welcome surely means what it says. It is well that you have come. You must have done well in your Scouting to have been chosen to be here. I want to coin a new word for you to remember; the word is "Welgo" - go well now on your way, carrying with you the light of Scouting like the Marathon torch, and work well, play well, think well, act well, and spread the ideal of Scouting as far as you personally possibly can. We trust you Scouts of the world to help to bring about the reign of peace and goodwill in all the world. "Welgo to you all". Following Lady Baden-Powell’s address, the Jamboree Song was sung by all Scouts, and Camp Chief Dimitrios "Rann" Alexatos invited all present to renew their Scout promise. This they all did, in the many languages of the participating nations. Scottish bagpipes, the skirl of which has thrilled the Scouts at Marathon time and again during the Jamboree, and the drums of the Belgian Scouts, heralded the arrival of Crown Prince Constantine, while the Jamboree song was heard. The flags of the participating nations were then carried into the arena, followed by the shield-bearers, who lined up in front of the flags. Now that our Jamboree has come to an end, all of us here in Greece, and especially myself, are terrible sorry to see you go. For me it has been one of the greatest experiences of my life to have met you all personally. I am proud and happy to know that in 89 countries I have, today, so many good friends. Here at Marathon all of us have lived happily together united by our Scouting principles and determined to Scout for ever higher ideals and wider horizons. By living happily together during these ten days we have not only lived up to our Scouting ideals but also to the highest hopes expressed by the United Nations. To be a true Scout will help us later in life to build a better world: a world of happiness and understanding. Ancient history associated Marathon with victory and war. Modern history, through each one of us shall make it mean victory and peace. Our victory shall be the knowledge that all of us are pioneers under one heaven and brothers upon one earth. We pledge ourselves for the rest of our lives to fight prejudice against colour, creed and race. With this pledge in our hearts let us go towards a better future. Let us work for the true brotherhood of man and thus learn not only to Scout but always to live for higher ideals and wider horizons. I bid you all farewell till we meet again at the 12th World Jamboree in the United States of America in 1967. Brother Scouts - I now declare the 11th World Jamboree closed. 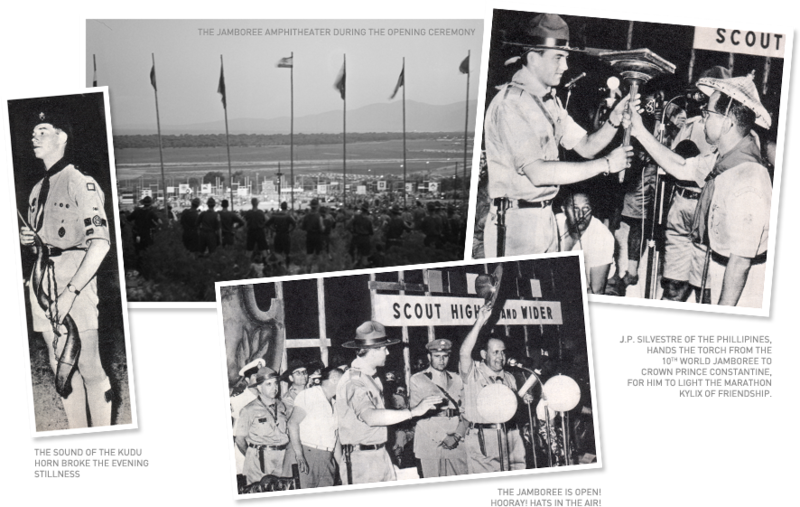 Crown Prince Constantine then announced that the country to host the 12th World Scout Jamboree would be the United States. As the Crown Prince finished speaking, the Jamboree song was heard again, and one Scout from each contingent entered the arena, lining up in the formation of a Scout fleur-de-lys. U.S.A. Scouts then entered in three ranks of six of the two sides, and formed up on either side of the fleur-de-lys. Three U.S.A. Scouts advanced and entered the fleur-de-lys. 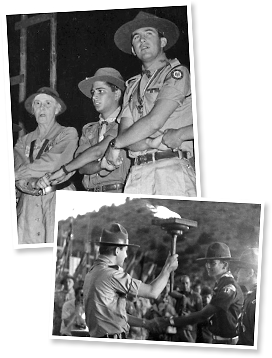 The Marathon "Torch of Friendship" was handed by Crown Prince Constantine, Chief Scout of Greece, to an American Scout to be rekindled at the opening of the 12th World Jamboree, four years later in the United States. This Scout was Dean Lycas, a 16-year old Eagle Scout of greek-american stock from Hammond, Indiana. Dean was extremely kind to send us his personal diary from the 11th World Jamboree to be included in this online tribute. To the sound of the kudu horn, in a hushed amphitheatre, one Scout from each nation entered and formed a circle of friendship around the feur-de-lys, and all stood to attention as the Jamboree flag was lowered, to the singing of the Jamboree song. Auld Lang Syne and Taps completed the dramatic closing ceremony, with a final singing of the Jamboree song as Crown Prince Constantine and officials left the arena. 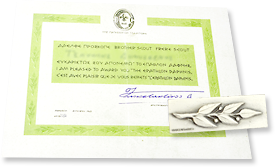 Upon arrival at the Jamboree, every Scout was provided with a score card that also doubled as an identity card; he had to see that this card was signed by the responsible Scouter each time he completed an activity. Before the end of the Jamboree, the Sub-Camp Chiefs collected these cards and prepared a list of those eligible for the Laurel Award. The names were submitted to the Jamboree H. Q. (Programme Service) who prepared the Diplomas. The Awards were presented by Sub-Camp Chiefs in special ceremonies be held in their camping area. The Laurel Award badge was worn above the right pocket of the scout uniform shirt.